This beautiful pattern is new for January 2015. 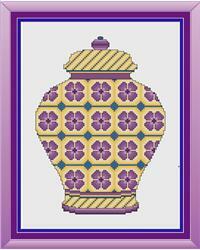 A stunning Ginger Jar with a bright and bold floral theme. I have used a traditional colour theme with several shades of yellow and purple, creating a unique piece. The chart and measurements have been calculated for stitching on 14 count aida or 28 count evenweave fabric. This chart contains full stitches, four fractional stitches and quite a bit of backstitch in various colours. Suitable for stitchers of all abilities, although some previous experience would be helpful. The finished design will measure approximately 88 x 131 stitches, (approximately 7" x 10"). You will receive a printed black and white easy to read symbol chart , a complete thread key, a computer generated picture of how your finished piece will look, along with some basic instructions.